Easily identify if anything goes missing from your RV's outside storage. Use the app as a packing list so that you never forget anything. Easily export your storage list to Excel. Includes our Campground Tracking app and 5th Wheel Owner Towing Information app. Easy to Use with no Download Needed. Easily Find Items. The Storage Organizer app is easy to use and allows me to store exactly where each item is located in the 5th wheel and the truck box. Whenever I cannot find an item I simply pull up the app on my phone and do a quick search. The app shows me the exact location of the item I am looking for quickly and easily. Use the app for all of your storage bays, under bed storage and truck box storage. If there are other places that you store items then simply add them into the app. It's quick and easy. A few days ago I found one of my cargo bay doors slightly open while camping in an RV park. It seemed that there were items missing but I was not sure what those items were. I pulled up the Storage Organizer and did a quick inventory for the items the app showed should be in the cargo bay. Sure enough I was missing some tools. If I had not had the app to show me what was in the cargo bay, I would never have known anything was missing. If any of the items had been high value, I would have been able to use the Storage Organizer app to identfy those items and that would have helped with any theft reports and insurance claims. If you unpack your camper after each trip, you can use the Storage app as a packing list. Just add the items to the app when you pack the camper. The next time you need to pack your camper just refer to the app list and you will never forget anything. Often we have items stored in plastic containers that are then stored in a Cargo Bay. The Storage Organizer app can keep track of these items as well. When adding your container items to the app simply include both locations. As an example, if I have stored a cordless drill in a blue plastic container in my 5th wheels cargo bay, I can add it to the Storage Organizer app as Blue Container-Cordless Drill under the Cargo Bay 1storage Location. If there are multiple containers in the cargo bay you can number the containers with an adhesive label to easily identify them. When I do a search for 'drill', the app will show me the cordless drill location as Cargo Bay1 - Blue Container and any other locations that I may have a drill stored. I only add items to the app that I don't use on a regular basis, as they are the ones I normally forget where I put them. The Storgae Organizer app can be accessed on any device connected to the internet. There are no confusing downloads for the app. Simply login to Fifth Wheel Magazine by clicking the Login link at the top right of the page, and you will have easy access to the app as well as other subscriber tools provided by Fifth Wheel Magazine. The Storage Organizer app uses a unique identifying number that is allocated when you signup. All information in the app use this unique number to identify stored items. No other identifying information of any kind is stored, making the app completely safe and secure. 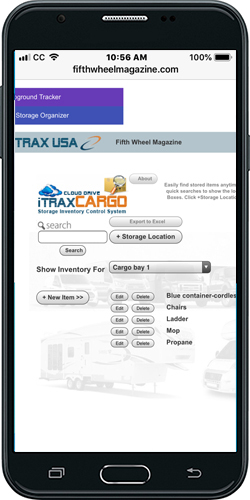 iTrax is the name of Fifth Wheel Magazines' online subscriber tools. As a subscriber you also get access to iTrax Venture which is the online campground tracking app and access to the 5th Wheel Owner Towing Data tool. Many RVers like to be able to access their information in Excel as a backup, so an export feature has been provided whereby you can export all of your storage information to Excel with the click of a button. When you click Export, the app will create a csv file which you can save on your computer. Simply open the file with Excel or any program that can read csv files and you will have your own copy of your storage location information.